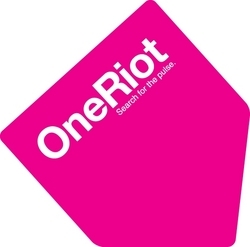 Real time search engine OneRiot, celebrated its one year anniversary on Friday by shedding its beta status. The change is notable considering OneRiot was a complete overhaul of the social site Me.dium, making this the full fledged version of the product. With the change comes a new look for the site, along with a new back-end technology the company is calling the "trending topics engine." This new engine takes the entire public data feed from social sites like Digg, Twitter, Facebook and MySpace, and groups together what it considers to be emerging topics. These topics are then bunched together by relevancy, then ranked by the company's PulseRank algorithm. The result is what the company says is faster way to see what's up and coming in social chatter, and one that will be more detailed than before. You can, for instance, now see several related links underneath each main topic, whereas on the old site you would only just see the one. More than anything though, the site has put a larger emphasis on timeliness, adding a large clock in the top left-hand corner next to a constantly-changing ticker tape of trending topics. What may be the most interesting change to come out of the face lift, is that there's less of an emphasis on the search bar, which has been shrunken down considerably, and put back up at the top of the page. At the same time, each topic still acts as a topical search on OneRiot's engine. These changes definitely give the site more of a news page feel, while continuing to push users to results pages where advertising awaits. In an e-mail to CNET about the change, OneRiot's president Tobias Peggs said that "80 percent of the search queries we see at OneRiot are users looking to track today's trending topics," and that matching advertising to these trending topics was "increasing clickthroughs by 17-20 percent." For a site that makes a living off these ads, that's no small number. This is what OneRiot looked in beta and how it looks now.